Injuring your finger - however it happens - can be a huge inconvenience to daily life. With how often we use our fingers, it can be difficult to fully heal. 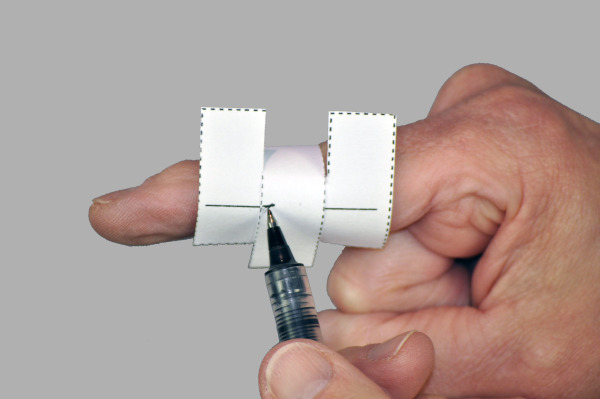 That is, until you have a high-quality finger splint like this Oval-8 trigger finger splint. This is an easy-to-wear finger splint that will both stabilize and align the small joints of your fingers to aid in healing and improve hand function. Designed to treat a number of conditions like trigger finger and swan neck deformity, this splint is incredibly comfortable with its thin, light design and is available at an affordable price here at MMAR Medical. You can even wear this splint on multiple fingers at once without limiting hand function! Finger splints for rheumatoid arthritis are available in a variety of places - but here, you can rest assured you’re getting the best based on our decades of experience in the industry. Invest in your own Oval-8 splint for mallet fingers, arthritis and more right here, and know that you’ll be on the road to recovery in no time! Indications: Mallet or Trigger fingers, Swan Neck, Boutonniere deformity, hypermobility; and protecting fractures or jammed fingers. Please note that Oval-8 finger splints are not recommended for children under age 4 as they may cause choking if swallowed. If your finger(s) tend to swell, order a set that includes larger sizes. If you have swelling that is expected to go down, order a set that includes smaller sizes. If you will be wearing splints in water or during cold weather, order a set that includes smaller sizes. If you have been sized by a health care provider using the Oval-8 splints and know the correct size, or are ordering a replacement or additional splints, you may choose to order individual sizes. Caution: Please note that Oval-8 finger splints are not recommended for children under age 4 as they may cause choking if swallowed. 1. Visit your health care provider or medical supply specialist. The angled band of the Oval-8 design allows each of the 14 sizes to fit a full Oval-8 size and a size and a half. Oval-8 splints can be fit over bandages or thin gel sheeting or gel tubes as needed for cushioning and protection. Choosing the correct size Oval-8 splint is best done by a healthcare provider or medical supply specialist using the splints themselves in the professional Sizing Set. The second best option is the NEW Oval-8 Sizing Guide for a “do-it-yourself” option. Designed to determine a range of sizes certain to fit, the Sizing Guide is easy to use and makes ordering Oval-8 Finger Splints easier than ever. Once the range of sizes is chosen, simply click on the Where To Buy link to choose the web store of your choice. Oval-8 splint sizes are close to, but not a perfect match for, jewelry ring sizes. A ring size will be close and ordering a set of Graduated Sizes will improve the chance that you have the best size for your finger. Ask the jeweler to fit the ring gauge around the joint where the Oval-8 splint will be worn. Do not fit the gauge where you wear a ring. As each Oval-8 splints fits both a size and a size and a half, if the ring size is an 8 and a half, the Oval-8 size 8 would be the proper one to choose. With a total of 28 sizes, it is rare not to find an Oval-8 size that fits just right. If the size or length is not exact, Oval-8 splints can be adjusted. Because a high degree of heat is required to make an accurate adjustment, it is strongly recommended that any adjustments are done by a Hand Therapist, Occupational Therapist or Orthotist. For links to a Hand Therapist in your area, please click here. Oval-8 Finger Splints are not returnable. 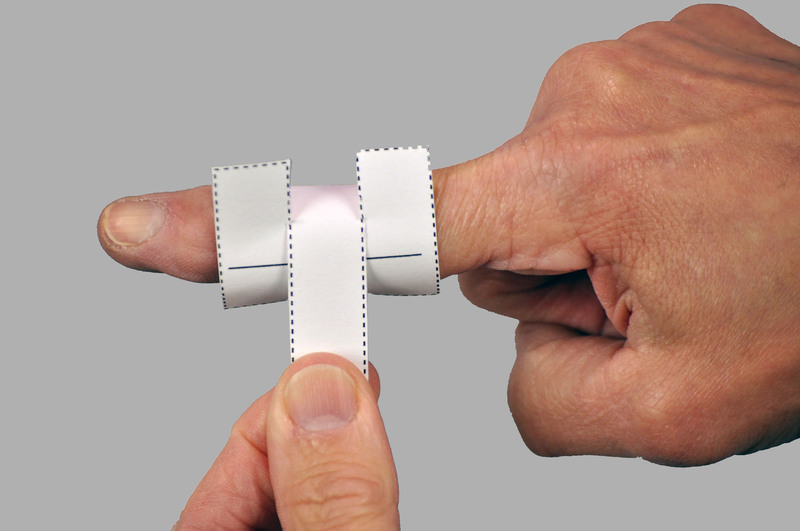 Individual splints may be exchanged for size correction only. Oval-8 Kits and Sizing Sets are not returnable. 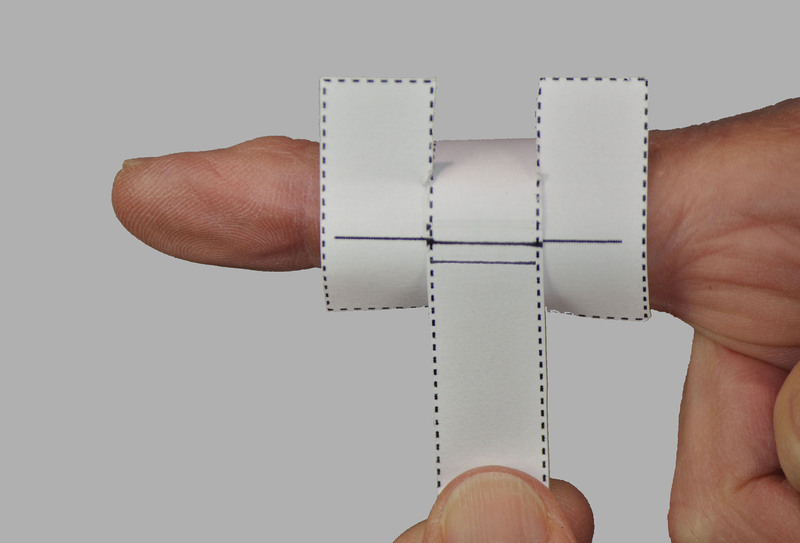 The Oval-8 Sizing Guide will help you choose the size splint most likely to fit your finger. Since even slight swelling or temperature changes can affect finger size, choosing only one size splint does not guarantee that size will be 100% accurate. We do recommend ordering a Graduated Set of 3 sizes for greater accuracy in sizing. 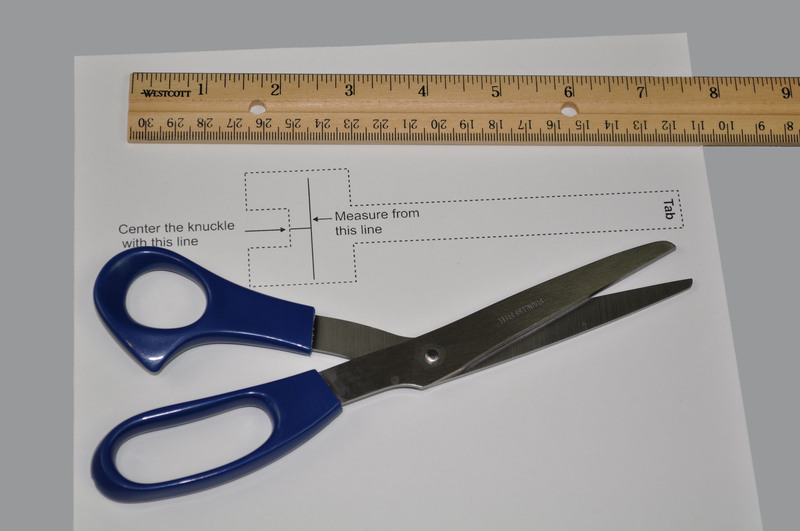 To use the Sizing Guide you will need a pair of scissors and a ruler with 1/16” increments or a metric ruler. Cut out the guide below along the dotted line and follow the instructions below. 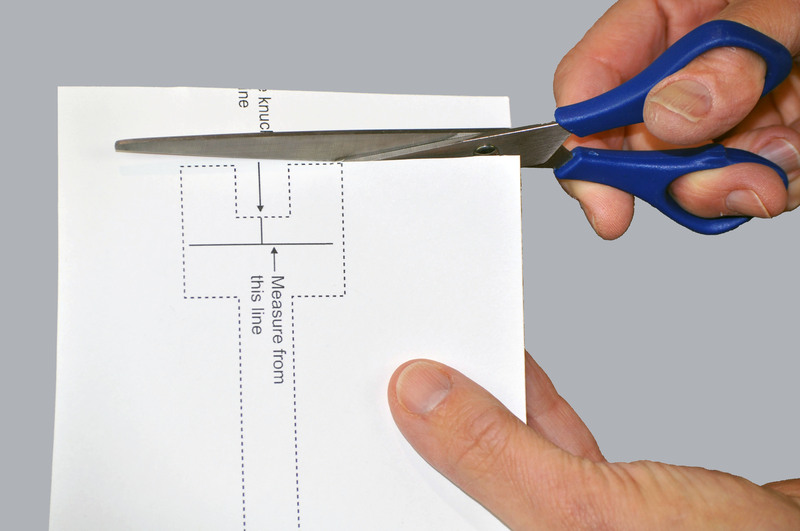 If using scissors is difficult, you may wish to have someone assist you with cutting out the Sizing Guide. *Guide above is not actual size. Please use guide on printable version for measuring. 1. 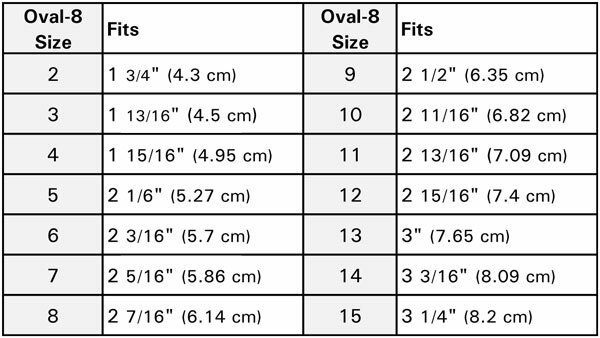 Cut out the Sizing Guide along the dotted line. 2. Line up the center of the notch with the center of the knuckle being measured. 3. 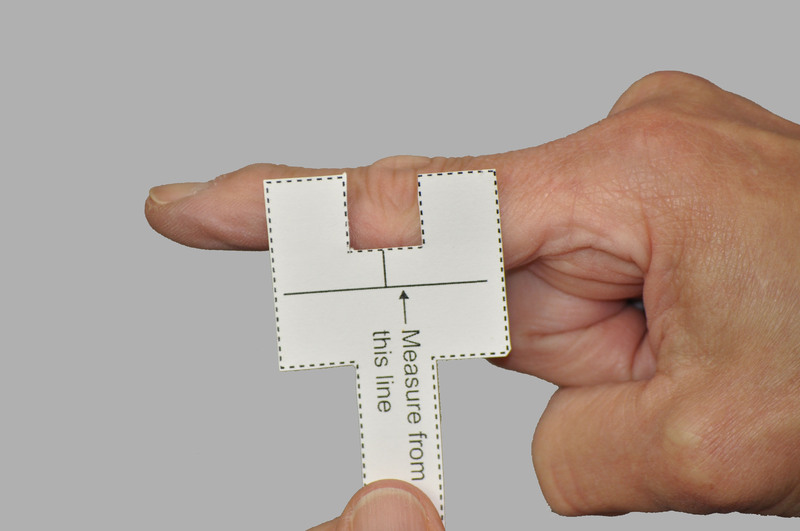 Wrap the long tab around the finger and through the notch until it overlaps the “measure from” line. 4. Pull lightly on the tab so the paper lies evenly around the joint. Draw a line on the tab where it overlaps the measurement line. 5. Pull the tab more firmlyaround the joint for a tight fit and mark a second line on the tab where it overlaps the measurement line. 6. It is recommended that you mark the tab in 2 places to establish a range of sizes to choose from when determining which Oval-8 sizes you may need. 7. 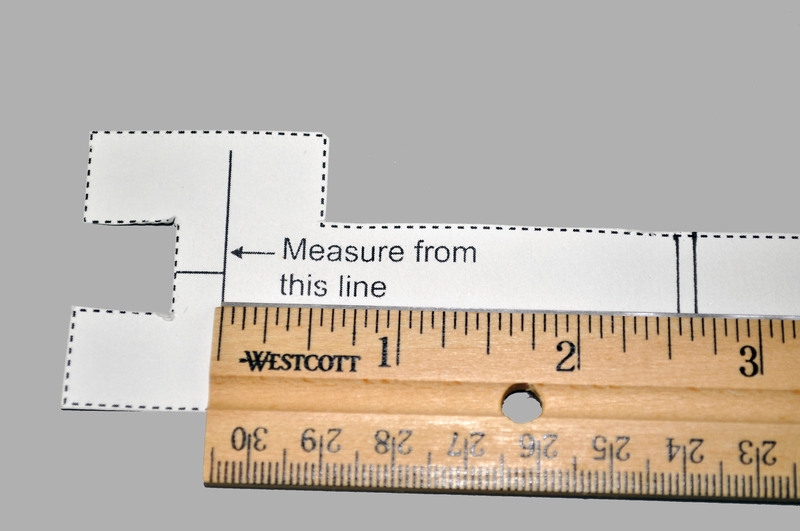 Using a ruler, measure from the printed line to your marks. Measure these distances to the nearest 1/16” or millimeter. 8. Use these measurements to determine the recommended range of Oval-8 sizes for your finger. guarantee of accurate sizing. Temperature and time of day may affect size choice. The simple, elegant design of the Oval-8 splints allows them to be worn different ways on the fingers to treat a variety of common conditions. Oval-8 splints improve finger stability and alignment for better hand function. 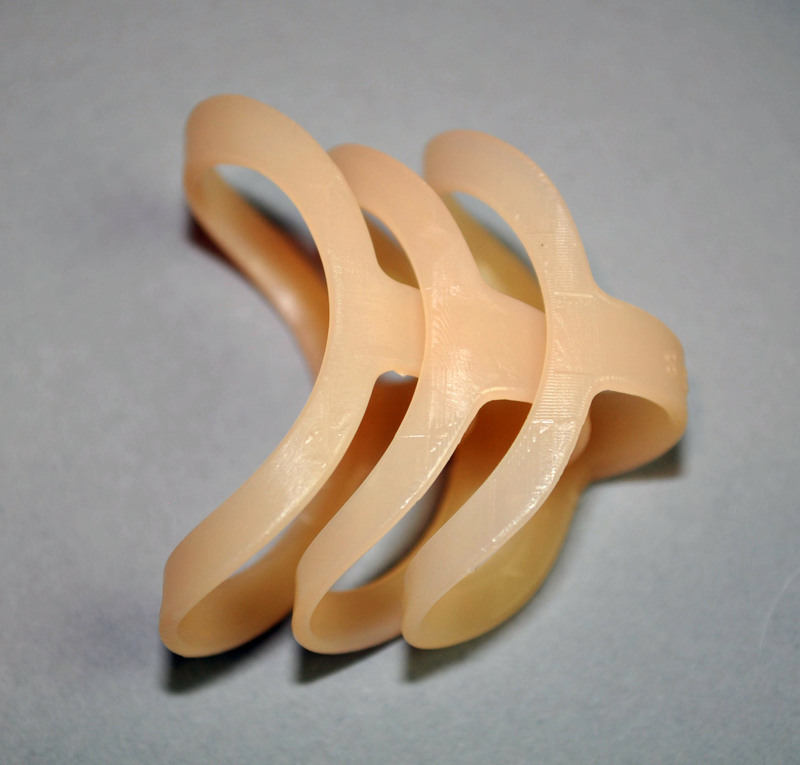 Seamless, molded Oval-8 splints are so light and comfortable, they are hardly noticeable to the wearer. No messy tape or straps are needed so they can be worn in water without removing the splints. Oval-8 splints can be worn long term for persons with arthritis to align crooked fingers and may aid in preventing the progression of deformity. A full range of 28 full and half sizes provides a fit for nearly every finger.